There’s one race that I have done every year since its inception, and I know I’ve mentioned it before: Mud Ninja. The Mud Ninja is a local race here in central Ohio, and it’s one that has gained a lot of fans over the years: American Ninja Warriors Michelle Warnky and Amy Pajcic have competed in the past (and Pajcic won the women’s title and Warnky won her 31-35 age group this year). 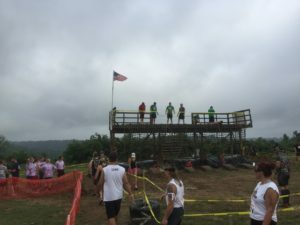 And the race has just gotten bigger with its inclusion in the Ohio OCR Grand Slam series of races with events like the Indian Mud Run, the Black Swamp Dash, and more. It’s a great race that keeps switching things up year after year. Typical example of Mud Ninja’s mud quality and content. It’s high. Mud Ninja is a 5K course that contains more mud obstacles than the next three races you can think of, I’m willing to bet. 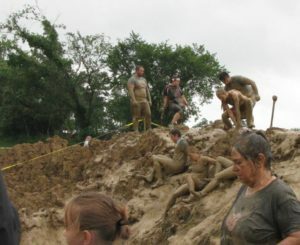 It’s a filthy mess of a race, with several mud pit-type obstacles including a series of five up-and-down into pits followed by a finishing mud crawl right at the end of the endeavor. It’s also got some very innovative obstacles that have been copied by big races such as Tough Mudder (no exaggeration: my wife was talking to the Tough Mudder rep at the race one year as he looked at an obstacle and said “why didn’t we think of that?”). It’s got incredibly tough terrain – the race goes down one side of a plateau, up again, down the other side, and up again, with obstacles not only on the plateau but also on both inclines. The steepness lends itself to a couple of the obstacles as well. The fun thing about a race like this, where you’ve done it year after year, is to enjoy the differences and also your improvement. The first year I did it, I took it on as a “Maniac Mud Ninja” participant – with 2 gallon jugs of water on my back in a pack. It was one of the harder things I’d ever done, and entirely one of those transformative experiences that changes your impression of what you can do. The second year I did it with a group of ten friends and we had a blast. It rained, it was mucky and slippery (and according to my wife, cold if you weren’t running), and we enjoyed every minute of it. I’ve done it solo in the heat, with broken fingers, had improving levels of success here and there, and will keep coming back as long as I can. Pre-race selfie with my running partner Meredith and I. No mud yet… YET. This year’s iteration of the Mud Ninja was no exception – a great, fun race with a fantastic vibe and a lot of enthusiastic folks running in it. And it was also the second year I’ve run it with a newbie: my friend Meredith. 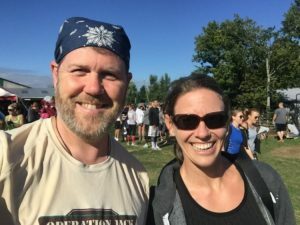 Meredith is a few years younger than me and has been doing Crossfit for a few years, and this year she decided to take it to the next level with her first OCR. She was a bit nervous, but was totally ready to go and at 10:00 on July 29, we took off on our wave to see what the Mud Ninja was ready to offer us this year. The course began with a trip down the side of the small plateau we were on at the start. The Mud Ninja wasted no time in showing us just how muddy and mucky it was going to get this year. There had been off-and-on rain for the days leading up to the event, but on the day of the event we had beautiful skies and about 73° temperatures – couldn’t have been better for the race itself. But the mud had taken on an extra special goopiness/stickiness vibe this year with the chemical wonderment that the previous days’ weather had applied to it. We went through our first mud pit and bam… shirts destroyed. I think that was a good thing for the newbie runners – got that trepidation about the gunk out of the way nice and early. And it made you appreciate the couple of water obstacles even more as opportunities to clean up a bit. There was a lot of up-and-down to go through on that side, with plenty of crawls and steep climbs (some requiring some help from a dangling rope or two). The terrain at Mud Ninja has a lot of dirt and rocks, you really need to watch your footing with a lot of it – but luckily a great portion of this race was in the shade. It made for more comfortable running (not that it was super-hot out anyway). I got the chance to throw out some obstacle advice to Meredith – like ignoring the snakes in the “Midnight Snakebite” obstacle (an in-the-dark crawl through mud, where they occasionally throw in rubber snakes to mess with people. I’m serious, I have grabbed a couple by accident over the years). The big obstacle at Mud Ninja – the always challenging American Ninja Warrior! We made it back up to the plateau at about the halfway point. A lot of the big crowd-pleaser obstacles are, of course, up near the starting line and where it’s most easy for spectators to follow. This time, that included the big feature obstacles: the 12-foot wall and the now-famous American Ninja Warrior. This is the one where you use a springboard to jump over a mud pit (of course), hopefully grab onto the netting that hangs from the platform on the other side of said pit, and pull yourself up. If you miss the jump and land in the mud pit, there’s a rope to climb out of the pit and up to the netting. Last year I nailed this one for the first time… and after this year that remains the only time I’ve nailed the jump. I had a good jump, but slipped and had to use the rope after splashing into the muck. Meredith had similar luck and we laughed our way to the top. After the twelve-foot wall, we had a couple of smaller obstacles including some monkey bar-type stuff and another mud crawl, and then headed down the other side of the plateau to take on the hills over there. This included the famous Widow Maker climb, which was the site of a 45-minute backup in 2013 when I ran with a team of ten folks – the rain at the race that day being the primary culprit then. It was still just as challenging a climb, but much drier and with less of a wait this time. And of course, there was still a drummer at the top rocking along to his favorite metal tunes (Mud Ninjas, apparently, are not quiet). Getting back to the top, we passed by the “Little Mud Ninjas” course and headed over to the last series of obstacles – including the “Superman II” slide into a pond, and the newest obstacle this year: “The Legend.” The idea was that you jumped onto a swinging platform (an unstable one, at that) and grabbed a hanging ring, then swung to the next platform, then the next ring, then the final platform. Lost my momentum entirely going to the final platform and got stuck, so had to fall into the muddy water to finish that one up. We had been treated to a video of “The Legend” in the days leading up to the race, and let me tell you the guys in that video made it look easy. The race then came around to its conclusion, with the grip-torturing ring swing and the “Rogue Wave:” an American Ninja Warrior “Warped-Wall”-like final climbing obstacle that led into the final series of mud climbs and pits, and then the final mud crawl. The Rogue Wave is one that has gotten to me in the past – having hurt my finger on it for two years running. I did my rope grab with the opposite hand this year, though, and forcing myself to think about that grab made it go more smoothly, I think. Then as Meredith made it up as well, we got the opportunity to help a couple other folks up – including a guy who was so pleased at being able to surmount it that he gave me a big muddy hug after he succeeded. I love those moments at an OCR! The final muddy ups and downs weren’t awful this year, until you jumped off the last climb into the mud pit right before the final crawl. You know how usually you jump into a mud puddle and it splashes? Yeah… the last mud pit didn’t do that. You leaped in, and the mud was so clingy and thick that it was like jumping into a pool of chocolate pudding. There was little spray, just a sort of “shlorp” sound and then you had to crawl out of it, under a series of ropes (like a barbed wire crawl at other races). I had never seen mud like that, even at previous iterations of Mud Ninja. As we crawled out of the pit and over the finish line, my newly-gotten ninja star Mud Ninja medal was immediately hidden under all the mud on my body. It was pretty nasty. The race is over, but the mud lives on forever in your blood and soul. Meredith and I grabbed one more post-race picture and did our best to remove the pudding-like mud from our arms and legs before heading over to the Little Mud Ninja race with the kids. Yeah, it was their turn – they’d waited long enough for their shot at the mud. My kids, 12 and 9, and Meredith’s kid, 4, had a blast going through the challenging Little Mud Ninjas course. There was plenty of room for the kids to have a parent coach them from the sides and even to help them through some of the deeper mud pits. I got to see my son (I’ve mentioned in the past that he is autistic) conquer the entire course – which is always fantastic to see. Highlights of the kids course was watching Meredith’s offspring careening down a mud slide and going sideways. He ended up going all the way under the muddy water with only the final advice of “close your mouth!” from the sidelines before he went in (and was quickly pulled to the top. All three kids had a great time and got massively muddy. Both the adult and kid courses were very well-marked this year, I thought. Other races have been less so, but there was a clear effort to make sure that the course left no mistake to which way you should go with the use of orange flags and caution tape where appropriate. They were both challenging and fun, and left you exhausted and satisfied. The volunteers were great – they helped when necessary, made sure everyone was safe and had fun, and left all questions answered. The concessions were great – lots of food trucks. There was a big soap bubble generator near the showers for the kids to play in (and for the adults to begin the de-mudding process). Gear check was free, as was spectator access. Registration was fast and organized, and the t-shirts this year looked great. The only detractor was the line for showers – there could have been more showers available – we waited approximately 45 minutes for a shower (which I might have forgone had my son not really wanted to have cleaned up). All in all, Meredith summed up the Mud Ninja 2017 experience more than adequately with a “TOTAL BLAST!” After the more rigorous Tough Mudder and Indian Mud Run I’d done this year thus far, Mud Ninja was an easier but by-no-means easy event – it was totally enjoyable, reminded me why I like running with friends instead of just being alone. And as I said earlier, it’s always neat to see how you improve on the perennial favorite obstacles while enjoying the new twists that the maniacal Mud Ninja decides to throw at you. I will continue to highly recommend this great event to all my OCR-loving friends.